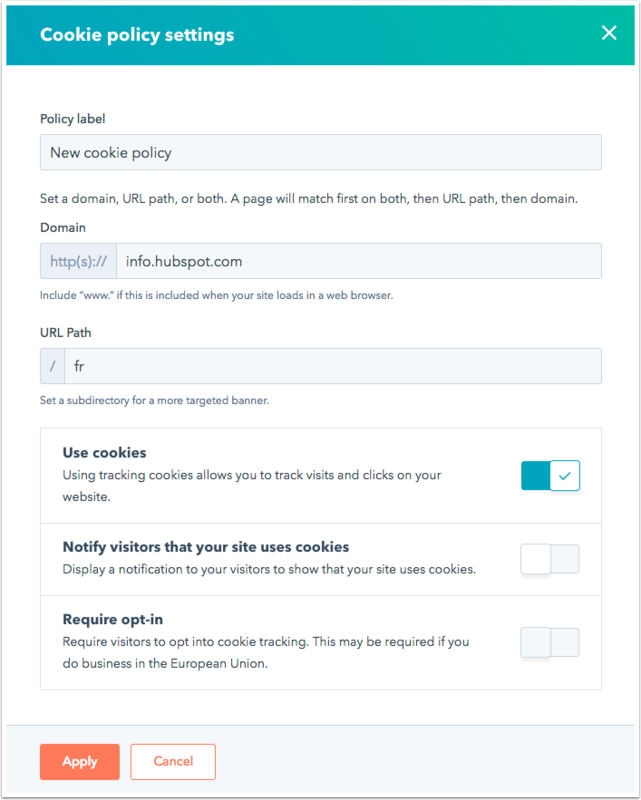 A privacy alert allows visitors to opt in or opt out of being tracked in your HubSpot account with cookies. This feature works for all HubSpot pages as well as any external pages with your HubSpot tracking code installed. How does HubSpot track website visitor activity? Under the GDPR, if a contact of yours is an EU citizen, they must be given notice that you're using cookies to track them (in a language they can understand), and they need to consent to being tracked by cookies. Require opt-in (required under the GDPR): click to toggle the switch on to require users to opt in to cookie tracking. Notification terms text: text displayed in your privacy banner. Accept button label: button text visitors click to accept your privacy banner's terms. Decline button label: button text visitors click to decline your privacy banner's terms. Disclaimer text: text displayed if opt-in is required for tracking. Learn more about implementing additional consent status and cookie removal functions in the developers documentation. You can choose to show different versions of your cookie consent message based on domains, subdomains, specific URL paths, or both domains and URL paths that you specify. For example, you can choose not to have an opt-in banner for your US site, and only require an opt-in banner for your EU site. Policy label: this is the title of your privacy banner. Domain: enter a domain or subdomain where your banner will appear. This must be entered as a domain without the protocol (e.g., hubspot.com or info.hubspot.com is acceptable, but not http://info.hubspot.com). URL Path: set a subdirectory for a more targeted banner (e.g., if the French version of your website is hosted on the /fr subdirectory, enter fr). 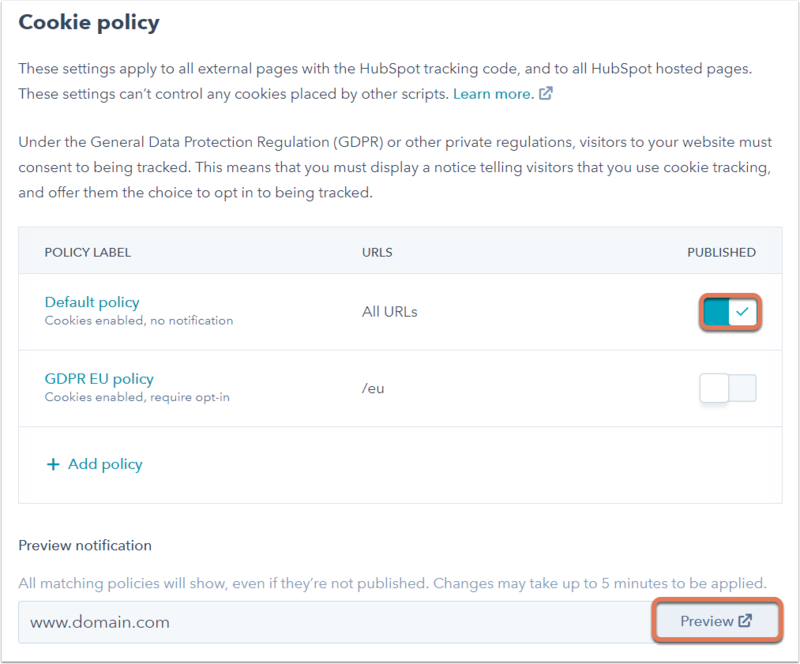 Please note: if a page URL matches multiple policy rules, the most specific rule will take priority (in order from most to least specific: (sub)domain and URL path, URL path, (sub)domain, then the default policy). For example, you may have three policies for the following domains and or URL paths: info.hubspot.com, info.hubspot.com/fr, and /fr. A visitor to info.hubspot.com/fr/offer will see the info.hubspot.com/fr policy, while a visitor to info.hubspot.com/fr will see the policy for the /fr URL path. Click the Choose a language dropdown menu to select a different language for your policy. Alternatively, you can click Start from scratch to customize the notification terms text, accept and decline button labels, and the disclaimer text for a different language. In the Cookie notification style section, click Check out new styles. Choose an accent color for the banner by selecting a default color or selecting a custom color. Click the Notification type dropdown menu and select Top banner or Bottom banner depending on where you want the banner to appear on your site. To publish a policy, click to toggle the switch on to the right of the policy. In the bottom right, click Preview to see how the privacy policies will appear on your site. Published policies will be reflected on live site pages that meet the specified criteria. In the upper right, click Create list. In the upper left, enter the name of your list. In the left pane, select Events and then, Privacy Consent. Select the appropriate filter and value. Revoked: the contact's cookies were removed. Learn more about the Remove cookies API. Click Save and let the list process. It will display the contacts that meet your filter criteria.